Great fun. Hobbit themed pub with oodles of atmosphere. Enter on street level, and then descend three floors to a massive beer garden where live bands play and burgers are on sale. Hugely popular with students and the young at heart. 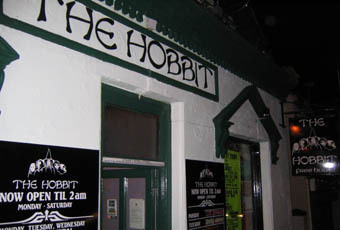 Attracted publicity when Stephen Fry and Ian McKellen offered to pay the costs when the pub was faced with a copyright infringement claim from the owner of marketing rights to Tolkien's works. No proper food offered, and real ale selection not exciting (pub focuses on Hobbit themed cocktails), the pub's main charm is the great atmosphere. This is a rare gem, and well worth a visit. Different sort of place than normal for me. Good vibe, but at 40 I felt too old. Nice beer, kitsch cocktails and great choice of music. Good cheap pub. Quiet in the day. by far my favorite pub in Southampton, great live acts, good beer, so much going on and Caribbean food in the beer garden what more could you ask for, staff are a good laugh, many weird drink concoctions the fellowship anybody? , like previous people have said not the cleanest and best looking place in the world but has plenty of character and will be back soon! Yes the toilets are still a disgrace, but what a fantastc pub. Great memories.